Running is one of America’s favorite forms of exercise. The reasons for its popularity are simple — it can be done almost anywhere, requires no special equipment, and burns lots of calories! Running also offers many health benefits such as weight control, decreased blood pressure and cholesterol, and relief from stress. Everything with running is fabulous, that is right up until the time you hear a snap, crack, or pop. 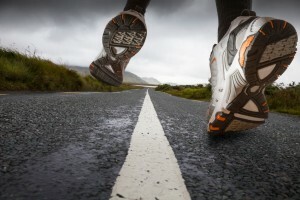 The downside of all the wonderful benefits is that running causes its share of injuries to the body. The Ohio State Chiropractic Association presents an alarming statistic that two-thirds of runners will be injured in some way. This has definitely been the case with my Overland Park Chiropractic patients. Tendonitis, shin splints, ankle sprains, hip pain, and knee strains are a few of the many injuries brought on or exacerbated by a regular running routine. It’s important to take common-sense precautions in order to always avoid the possibility of injury. Purchasing high-quality shoes and respecting the body’s limits are two easy recommendations. Another great choice is committing to chiropractic care in Overland Park. Regular runners can reap many positive results from visiting an Overland Park chiropractor. Loose and relaxed joints allow for greater flexibility and movement, all of which benefit a runner’s gait and time. A study published in the Journal of Chiropractic Medicine found evidence that a chiropractic treatment regimen increased mobility in the hips over time. While chiropractic care does not guarantee an individual will experience an increase in speed, unrestricted joints and better range of motion will definitely help a person move more freely and stand a better chance of avoiding running injuries. Unfortunately, runners frequently deal with injuries, some of which take weeks or months to heal. For dedicated runners, a serious injury is terrible news. The first action for runners after they have been injured is to stop running so it can heal. Most runners do not want to risk losing the stamina that interrupting their routine brings on. Our Chiropractors in Overland Park and Leawood can work with runners who have injured themselves from the repetitive motion of running regularly. By using non-twisting and gentle chiropractic adjustments, chiropractors can promote healing in the body as a whole. Runners love this because they want to get back to hoofing it as quickly as possible. A spine that becomes out of alignment can cause other parts of the body to be weaker and more susceptible to injury. One part of the body compensating for another that is off kilter is one common way runners end up hurt. Chiropractic treatment helps to keep the spine in alignment, which can have a ripple effect through the body. Regular adjustments we call wellness treatments can reduce the negative impact the jarring motion of running has on a person’s body and help avoid running-relating injuries on the front end. Dr. Jeff knows this all too way as he is an avid runner himself! Running is a popular exercise routine for many, and yields a multitude of positive results to a person’s health and well-being. By taking proper steps to minimize the chance of injury, runners can enjoy the good points running brings to the table and steer clear of the bad. Chiropractic care can be an effective part of making certain your body is in prime running condition and resistant to injury. If a person ends up dealing with an injury, chiropractic treatment may be able to boost healing time. If you are a runner and would like to talk further about the benefits chiropractic care offers, contact us today for a consultation at 913-681-7757. My husband and I pride ourselves on helping our patients be able to continue to do the workouts they enjoy while keeping their bodies as healthy as possible!